I have, once again found one of my grandfather's WWI Draft Registration Card on Ancestry.com. This time around, I found the draft card of my paternal g-g-grandfather, Lincoln David Heisz. I have saved the digital image from the website, and am sharing it with you below. 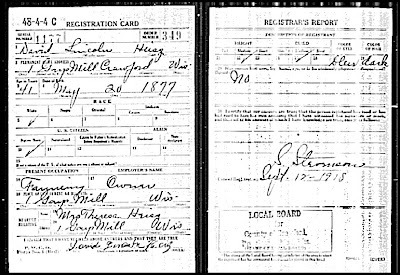 If you are having trouble viewing the image text, please click on the image to enlarge it or click here to view a WWI draft registration template. Two things about this registration card jumped out to me immediately. Did you notice? First, his name is listed as David Lincoln Heisz, not Lincoln David Heisz. While first and middle names often get reversed, this is the first document that lists his name this way. In all the US Census', Wisconsin Death Index, Social Security Death Index and family information, he is listed as Lincoln David. Second, his birth day is listed as 20 May 1877, not 20 May 1879. According to his Social Security Death Index the latter is correct. His headstone, however, splits these dates and states that his birth year is 1878. We can almost certainly discount this as his death year is wrong also. 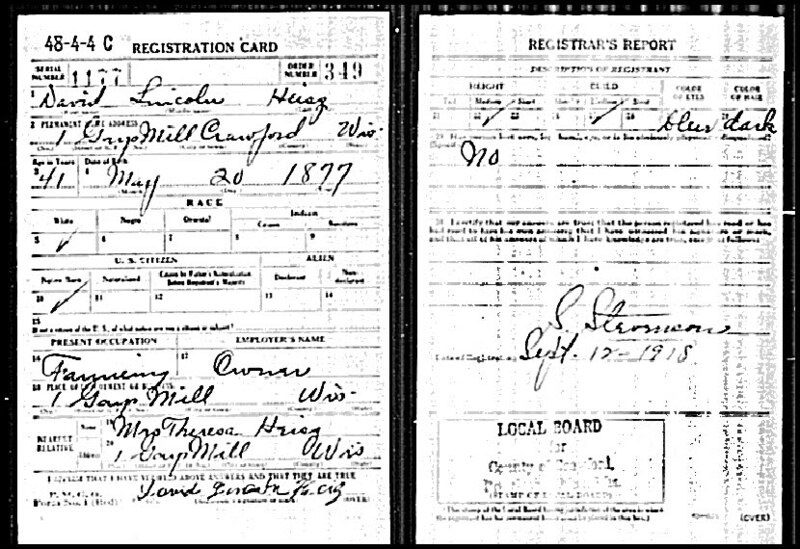 David Lincoln Heisz registered for the WWI Draft on 12 Sept 1818 in Crawford County, Wisconsin. He is listed as having been born a natural born citizen on 20 May 1877 in Crawford County, Wisconsin, making him 41 years old. At the time of the draft, he resided at (Route?) 1, Gays Mills, Crawford, Wisconsin. At the time of the draft, he was a self-employed as a farmer at (Route?) 1, Gays Mills, Crawford, Wisconsin. He was married with a wife, Mrs. Theresa Heisz, also of (Route?) 1, Gays Mills, Wisconsin. The Registrar's Report lists him as a man of medium height and build with blue eyes and dark hair, with no missing appendages or obvious physical disqualifications. I love it that they give a physical description of them.